Hei Zho (Prawn Rolls) & A Tiger in The Kitchen Book Launch! In the middle of a cold, gray New York City winter two years ago, I suddenly found myself thinking about my late grandmother. This was a woman I had barely known as a child in Singapore. A slender, bird-like lady who spoke nothing but Teochew, the Chinese dialect of my ancestors, the woman I called Tanglin Ah-Ma found it hard to have meaningful conversations with this Westernized, English-speaking granddaughter. Still, we found a way to communicate: Each time I went to her home, food would be set out. Delicious braised duck, gently slow-cooked in a heady mixture of dark soy sauce, star anise and cinnamon and filled with plump cubes of tofu and hard-boiled eggs; umami-packed salted vegetable soup and, at Chinese new year, pineapple tarts, a tiny buttery wonder of a cookie that comprises a shortbread base topped with sweet pineapple jam. I always thought I’d ask Tanglin Ah-Ma to teach me to make these dishes someday — but when I was 11, she passed away. Decades later in New York, I realized with deep regret that I had no idea how to make any of these dishes I’d grown up loving. And so I went on a journey, traveling from faraway New York to the country of my birth. Over the next year, the women in my family welcomed me into their kitchens — over many sweltering afternoons, my aunties, my maternal grandmother and my mother gently and gracefully guided me through the foods of my youth, of our shared history. It is a year that is priceless to me because of the stories they told as well as the recipes they generously shared. Just because my year in Singapore is over, however, it doesn’t mean that the quest to collect my family’s recipes has ended. You can’t put the genie back in the bottle, after all. And so during a recent visit to Singapore, when an auntie I only recently got to know mentioned that hei zho, a deep-fried prawn roll that’s Fukienese in origin, is one of her specialties, I found myself instinctively reaching for my notepad. The camera came out; a pen was located. It must be established that this Auntie Alice is not the Auntie Alice of the Hainanese chicken rice and braised duck fame in my book. But this Auntie Alice is as much of a serious cook — she used to do it professionally, in fact, something that you might pick up on as you watch her deftly move through the kitchen. 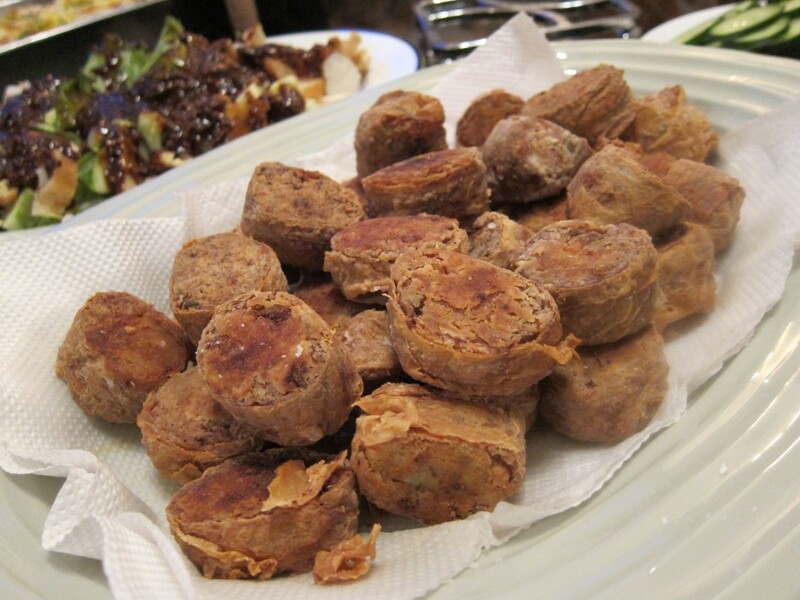 Hei zho, basically, comprises minced prawns, water chestnuts, scallions, pork belly and a bunch of other ingredients mixed together, wrapped with dried beancurd skin and formed into logs. As simple as it sounds to assemble, Auntie Alice cautions me to pay attention to one thing: “Make sure you slap the prawns on the side of the bowl a few times before mincing,” she says in Mandarin. 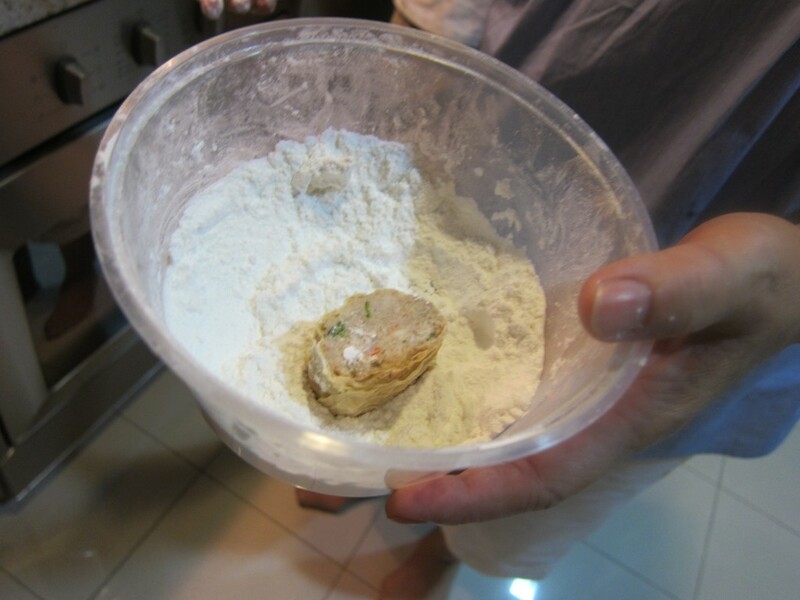 This, she says, makes the prawns stick to the other ingredients in the filling a little more. Once you’ve formed these logs, you steam them to cook them a little and then you can either deep-fry them and eat them right away or store them in your fridge for up to a month — a great make-ahead party snack, this. … and fry them up until they turn golden brown. The result is delicious — especially if you eat them hot off the stove and dipped in sweet chili sauce. 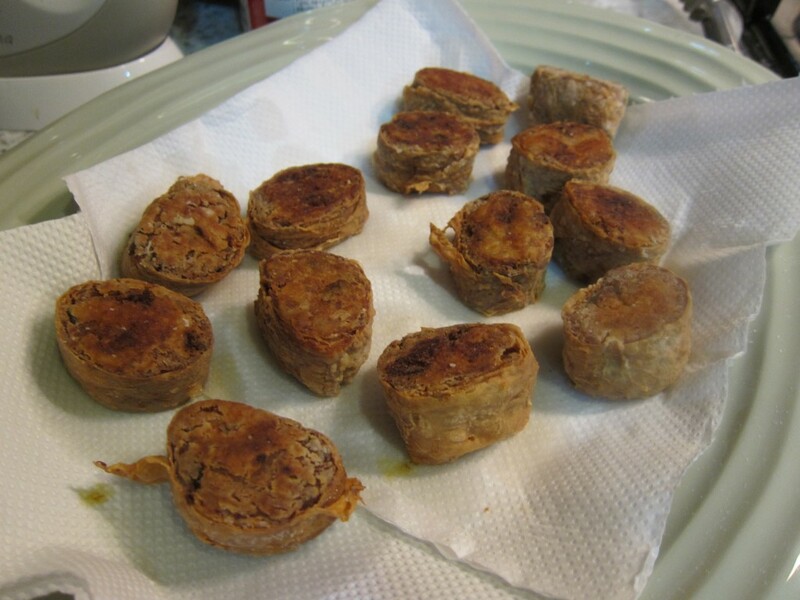 The filling is meaty and salty, with some nice crunch from the water chestnuts and the fried beancurd skin, and the chili sauce adds a nice little zing at the end. Now that my year of traveling and cooking is over, I have scarcely any reason to spend weeks on end back in Singapore, sadly. But while I may not have my aunties, my grandmother and my mother near me so much any more, what I do have is their recipes, the know-how to make their dishes and the memories of the feasts we made together. And that, dear readers, has been the truest gift of my journey. Several lovely bloggers generously agreed to join in on a “Share A Family Recipe Day” to help toast the launch of “A Tiger in the Kitchen” today — don’t forget to check out their pieces below. Smack the prawns against the side of a bowl a few times to soften them, then chop them up finely. In a large bowl, mix together the prawns, pork belly, water chestnuts, scallions, five spice powder, corn starch, sweet potato flour, salt and sugar. Cut up the sheets of tau kee into eight-inch squares and lightly rub them with a damp, clean cloth to soften them. Fill each square with prawn mixture lengthwise and roll up the sheet to form a log. Once all the logs are rolled, steam them for 15 minutes. Once the rolls have been steamed, they can be stored in a refrigerator for up to a month. When you want to eat the hei zho, remove them from the fridge and cut them up into 3/4-inch thick slices. 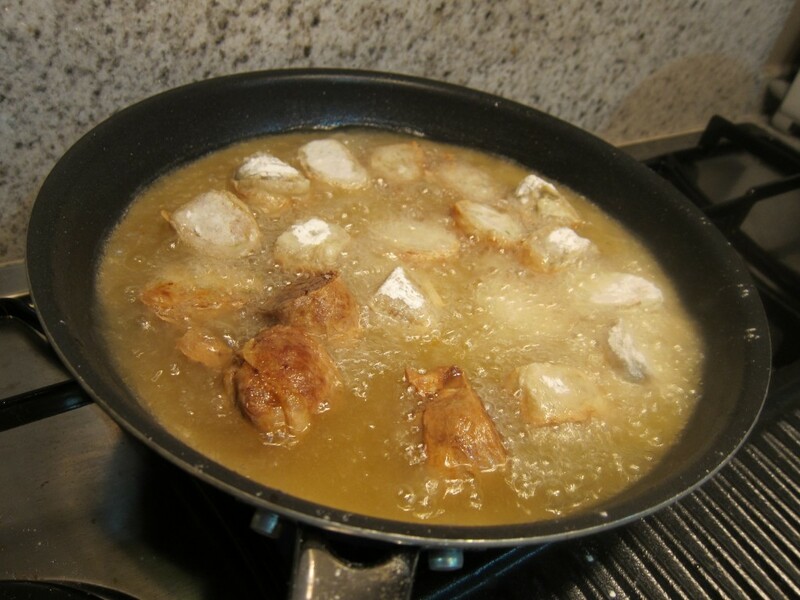 Lightly coat them with the mixture of cornstarch, sweet potato flour and rice flour and deep fry until golden brown. This entry was posted in Asian, Chinese, Recipes, Singapore, Singaporean, Snacks, Tales From the Road by Cheryl. Bookmark the permalink. Seeing your flour mixture puts a smile on my face, but enough about that. Who would you cast to play you in the movie? Cannot wait to get my copy of the screenplay, er, I mean book! I’ve been wondering about the differences between hei zho and ngoh hiang (apart from the former being sliced and deep-fried) and I think I have my answer: pork belly! Auntie Alice’s “yes, it’s that simple” look is priceless. And one that I know so well from recent years when I ask my parents about certain recipes or cooking methods. On the other hand, I also know that it’s a look of pride that I’m want to carry on these family traditions. CONGRATULATIONS!!! I can’t wait to read your book this weekend. Congrats, Cheryl! Can’t wait to read the book. It will be the first book I order on my new iPad, although I’m sad you can’t sign that! Congrats, Cheryl! Sounds like the book that all SG expats should have. Trying to get my hands on the book from Amazon UK but it would take up to a month to despatch! The agony!